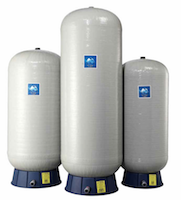 Aquaflo Pressure Tanks are manufactured by Global Water Solutions, an American company that is a leader in the manufacture of diaphragm pressure tanks. Aquaflo pressure tanks are 99% efficient. Conventional pressure tanks use only 25% of the water inside them. While a 42 gallon tank might look impressive, in reality, only approximately 12 gallons are used (“draw down”). With Aquaflo pressure tanks, 99% of the water is used. Thus, you can get rid of the excess size needed by conventional pressure tanks. This allows Aquaflo tanks to deliver the same performance while reducing it’s size. Aquaflo pressure tanks use a butyl diaphragm that separates the water inside the pressure tank from the tank’s metal surface, thereby eliminating corrosion and rust possibilities. Since the water is also separated from the pressurized air inside the tank, water-logging is eliminated. The double seal installed in its air intake prevents air leaks. Thus, after it’s initial installation, the Aquaflo pressure tank will continue to work with no further maintenance necessary. Aquaflo pressure tanks are energy saving devices. Since pressure tanks reduce the start-stop cycles of pumps, Aquaflo pressure tanks are an effective way of reducing the frequency of electricity surges needed to start a pump. The larger the pressure tank, the higher the electricity savings. The Pressurewave series range in capacity from 20 to 150 liters. They are available in vertical and horizontal models, and are well suited for residential applications. Click on the link to download the Pressurewave brochure. The Challenger Series are made in the USA, and range in capacity from x to y liters. They are available in vertical models, and are well suited for large residential and light commercial applications. Click on the link to download the Challenger brochure. The Super Flow series range in capacity from 750 to 2000 liters. They feature a replaceable EPDM bladder membrane and are available in vertical models. Super Flow tanks are well suited for commercial applications. Click on the link to download the Super Flow brochure. The C2-Lite delivers the proven performance of the steel Aquaflo pressure tanks in a lightweight, composite design. Suited for applications where exposure to salty or hard water is expected, C2-Lite tanks are the perfect pressure tanks to use for resorts and beach houses. C2-Lite range in capacity from 60 to 200 liters. C2-Lite tanks should be shaded from sunlight. Click on the link to download the C2-Lite brochure. To contact us regarding Aquaflo pressure tanks, please fill in the form below.